Unlock Your Potential! Train Harder & Supercharge Your Workouts! Pre-workouts are formulated to help you get the best out of your workouts. Using the appropriate pre workout supplements can help you to train harder which, in turn, creates more stimulus for muscle growth. Want to improve performance or need a boost when energy levels are low? 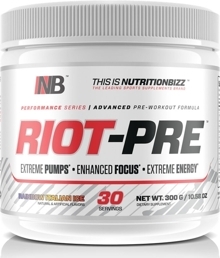 RIOT-PRE blends in the proven matrix of Beta Alanine, L-Arginine, Caffeine & L-Carnitine to provide you with Explosive energy, enhanced strength, laser sharp focus and increased endurance. Whether you are stepping into your fitness journey or striving to reach that next level, RIOT-PRE will help you unlock your full potential and unleash the beast within. DO NOT EXCEED 2 SCOOPS IN ANY 24-HOUR PERIOD. Blue Rasberry This is a Buy 1 Get 1 FREE offer!